Take this “Winners of the Nobel Prize in Literature” Quiz! So as a public service, I am pleased to present the “Winners of the Nobel Prize in Literature” quiz! There are two ways to play this game: Quick and Super Extra Special. For the Quick game, simply read though the list of the 50 most recent winners below and mark a tick on a piece of scrap paper every time you don’t recognize a name. At the end, count them up. For the Super Extra Special game, print out the list below and mark one of the following four words next to each name. 1. Yes. You believe the writer deserved to win the Nobel Prize. 2. Okay. 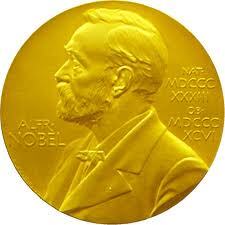 You believe it was not unreasonable for the writer to win the Nobel Prize. 3. Huh? You have no idea why the writer won the Nobel Prize. 4. Who? You have no idea who the writer is. Award yourself 1 point for each Yes, Okay, or Huh? you mark. Subtract 1 point for every Who? you mark. Subtract an additional 1 point (for a total of 2 points) for every Who? you mark next to a winner who wrote in English. These writers are indicated with asterisks. However, award yourself 3 bonus points each (for a possible total of 9 points) if you want to insist that Beckett wrote in French or Singer in Yiddish or Brodsky in Russian. No cheating! You win if you achieve a positive score. I scored minus 8 points on the Super Extra Special quiz and I’m not feeling very good about myself. I hope you do better. I am very depressed on minus 20 and think I will go back to bed! I admit that when I heard that Mo Yan had been awarded the Prize, my first reaction was that it was more political than literary. I haven’t read yet the explanation for the prize, and I haven’t read Yan, so I’m in no position to judge. There do seem to be distribution requirements, by culture, language, and nation, no two European writers in English in a row, for example, which I don’t have a problem with. The original instructions that the winner should bestow the greatest benefit to mankind in an ideal direction seems more political, because that seems to have tilted the prize more heavily toward second tier writers who deal overtly with political or social issues than I would like. But it’s the Swedes game and they can set the rules they like.